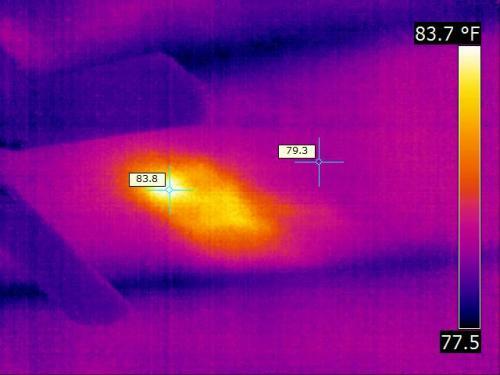 Electrical issues: Thermal inspection of residential electrical systems starts at the main panel. Loose, overloaded circuits or overheating wires can be identified based on their Thermal signature. These problems can cause visual excessive heat patterns on the images. The circuit on the right shows excessive heat pattern from (in this case) loose connections in the breaker. These potential electrical hazards can be identified using Infrared imaging without touching the component. Electrical switches and outlets in the home are also subject to the same problems. Insulation Issues: With summer temperatures in excess of 1000f, properly installed insulation can save home cooling bills. 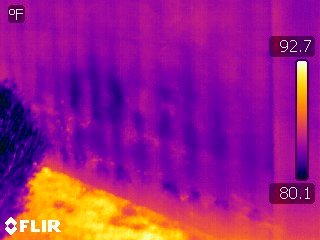 Poorly installed or missing insulation can be found by Thermal Imaging. 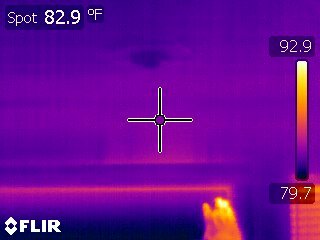 A Thermal camera can quickly and non-destructively find areas of missing, moisture-laden or otherwise damaged insulation in walls and attics or around doors, windows, electrical outlets and other access plates. 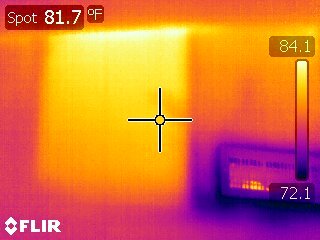 All can increase a building’s energy costs by allowing cold/hot air to enter the building .Thermal imaging can also identify poorly insulated or uninsulated pipes, another source of costly heat losses. 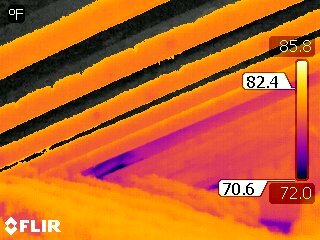 Moisture Issues: Thermal Imaging can identify building envelope moisture issues, plumbing leaks, leaking roofs. Roof leaks can be difficult to image due to our many days of sunshine and few days of rain. 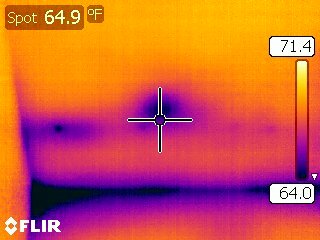 Plumbing leaks are easier to identify since the system can be tested at the time of inspection by letting the water run in appliances, showers, tubs, sinks and then evaluating by Thermal Imaging. and openings to the outside of the home. 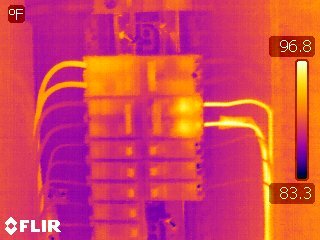 Thermal imaging is a widely accepted practice for inspecting electrical systems, determining the thermal efficiency of building insulation, checking door and window seals, and auditing the performance and condition of heating and cooling systems. 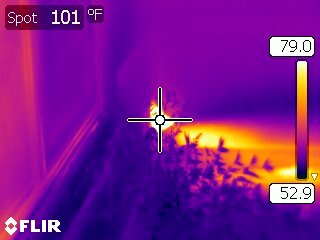 These are only some of the uses and examples for the use of Thermal Imaging in evaluation of homes. Similar uses for commercial application apply also.